The church is a hub for the community with many activities held during the week. These are a mix of external activities as described in the Calendar and those organised by the church with some examples below. Friday Biblegroup: 10 to 11.30 am. Each week a friendly group of six to ten people meet in the Quiet Room to study the bible together and pray. The leader prepares a bible passage and questions for us to discuss over coffee, and we finish with a few minutes of prayer. Everyone is welcome. Bibles may be borrowed, or bring your own. On Tuesday lunchtimes there is a simple lunch – soup and rolls - at 12.30, followed by a hosted discussion on a christian theme (1pm to 1.45pm). Everyone welcome. We also have a Homegroup running on Thursday evenings, and a Christian meditation group in the vestry on Wednesdays at 7.30pm. A supportive fortnightly group for parents with babies from the just toddling stage, roughly aged 12 to 24 months. Siblings welcome. We meet on the 2nd and 4th Fridays of the month from 2pm to 4pm in term-time, and to suit the needs of group members during holidays. There is no religious content in this session, which is open to people of all faiths and none. Donation suggested £1.50 per family. Parking is available from 1.45pm. 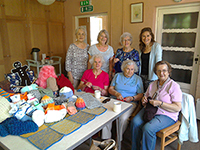 The Knit and Natter group meets fortnightly for an informal get-together. Over a cup of tea and biscuits we knit garments and soft toys. We are currently working on Teddy bears, hats, scarves and gloves to be included into the Shoe Box appeal at Christmas. We also make tiny blankets for the premature baby unit at the Lister Hospital and knee rugs for our Minister to take out to our house-bound church members. 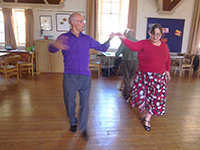 We hold monthly tea dances on Saturdays between 2.00pm and 4.00pm. There is an assortment of ballroom and sequence dances and the DJ is happy to include any special requests. 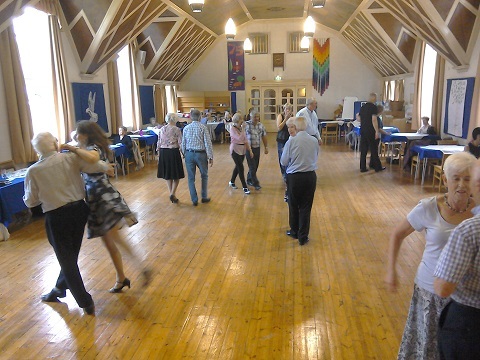 Dances are on the first Saturday of each month. Ring Jean on 07816274963 for further details. The Club meets every 2 weeks on the first and third Thursday and everyone is welcome. Its a place for friendship and chat over tea and biscuits with visiting speakers, quizes and outings in the summer. We open most Wednesday afternoons for babies and parents from 1.30pm to 3.30pm. Free parking in our adjacent carpark from 1.15pm. This is a friendly multi-cultural group available to all pregnant women and mums and dads with babies up until they are toddling. Come for refreshments and a chat, social time for your baby, and our short singing session (no religious content). If needed, you can bring an older child too and we will find them some toys from our children’s corner. It’s usual for people to feed their baby during the sessions – breast or bottle - and if desired we can move a screen to create some privacy – just ask. Donation suggested £1.50 per family. To check on dates in August and December, visit our facebook page WGC Baby Group. The Toddler Group continues to thrive on Thursday mornings during term time and there is still no shortage of new recruits. A chance for the toddlers to play followed by singing and then drinks and biscuits for everyone. Chatter and Tots starts at 9:30am and finishes at 11:30am. Our Christian Meditation Group has been meeting for nearly two years now. We meet in the Minister’s Vestry every Wednesday evening from 7.30 to 8.30, discuss how we are, listen to a recorded talk, pray and then meditate for 20 minutes, closing with a brief prayer. We welcome people from all denominations and none. We find this a wonderful practice, opening us up to the love of Jesus which is within each one of us. Do speak to Jane if you would like to know more about it. Please join us at our drop in Community Cafe’ every Tuesday for a coffee or tea and meet new friends. Some of our visitors have been coming for years and have made lasting friendships. Everyone gets a warm welcome and it is always lovely to meet new visitors. It is a morning of fun and laughter which is followed by our famous homemade vegetable soup at around 12:30. After lunch we have a topic we discuss and it is always interesting hearing everyone’s point of view. Summer months you can sit outside and enjoy the weather or just wander around the garden. A small donation is always welcome since it helps with the overheads and running of the Cafe’. Please do not hesitate to contact Liz on 01707 333326 for more information. Our community garden behind the church is always in need of nurture, including the flower tubs, flower beds in the remembrance area, vegetable beds and fruit cages, and childrens’ play area. And it is a beautiful space to work in, and relax afterwards with refreshments on the patio or in the seating area by the veg. beds. During the year we run occasional working parties, and volunteers take turns with regular maintenance and watering. If you would like to help please do get in touch.